The Oklahoma City Thunder were devastated when Kevin Durant made his decision to sign with the Golden State Warriors. It left Russell Westbrook as the last star left from the “big three” of Durant, Westbrook, and current Houston Rockets’ superstar James Harden. Despite the tough loss, the Thunder are a team to reckon with in the Western Conference. Sam Presti knows that in order to keep the Thunder relevant come playoff time, he will likely have to make a trade. There is one player in particular that Oklahoma City seems to have interest in. 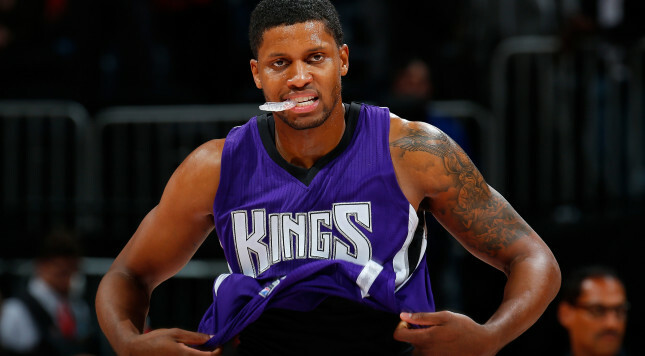 According to a report from Zach Lowe of ESPN, the Thunder are interested in acquiring Rudy Gay from the Sacramento Kings. They were linked to him earlier, but still apparently have interest. Needless to say, bringing in a player like Gay would immediately make the Thunder a more serious contender in the West. Pairing him alongside of Westbrook and the electric Victor Oladipo, the Thunder would have a third legitimate scoring option and their defense would take a step forward as well. Gay has averaged 21.3 points, 6.3 rebounds, 2.5 assists, and 1.3 steals per game so far this season. He has shot 47.7 percent from the field overall and has knocked down 42.4 percent of his three-point shots. Obviously, the Kings’ small forward has taken his game to a new level this season. Plenty of teams would be interested in acquiring those numbers at this point in the season. That being said, the Thunder may be the most desperate when it comes to their need of a scoring threat. The problem with the #Thunder looking at Rudy Gay is their best trade assets are all big men, and the #Kings have about 19 of those already. Not only would Gay immediately become a threat on the offensive end of the court, he would be exactly what the doctor ordered for them defensively. Gay would give head coach Billy Donovan a defender to go up against wing scoring threats like Durant. He may not shut those elite scorers down, but he can certainly slow them down as he has shown throughout his career. There is no telling what the Thunder would have to give up in order to bring Gay on board. Sacramento has always overpriced their players in trade talks, which is one of the main reasons that Gay is still on the roster. He has wanted out of town since before the 2016 NBA Draft. Expect to hear plenty more rumors come out about Gay in the coming weeks. Oklahoma City is one team that is still interested in acquiring him and it wouldn’t be surprising to see the two teams figure something out at some point ahead of the NBA trade deadline.